Cut chicken breasts in half and place each piece between two sheets of plastic wrap and pound with a mallet to 1/2-inch thickness. You should have four ½-inch thick cutlets. Lay down a long sheet of wax paper. At one end place the flour and at the other end combine the crumbs with seasoning and Parmesan. Put a bowl in the middle for the egg. Sprinkle the cutlets on both sides with salt & pepper. Dip each one into the flour, then egg, then crumb mixture. Place on baking sheet. Bake about 20 minutes until crispy and golden. Remove pan from oven, top each cutlet with 2 tablespoons marinara sauce and 2 tablespoons of shredded mozzarella. Return to oven & bake for 2-3 more minutes or until cheese is melted. Serve plain or top with chopped fresh parsely. Notes: I have also baked it at 425° F for 17 minutes and it came out a bit more crispy. For more on this recipe in my blog click here. 13 Comments on "Oven-Baked Chicken Parmesan"
Jenny, I am your life long fan! I served chicken Parmesan to my family today and the clean up is easy! Not to mention the delicious dish. 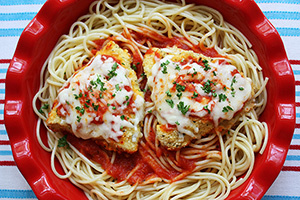 Chicken parm typically involves pan frying but not with your recipe. Thank you Jenny! 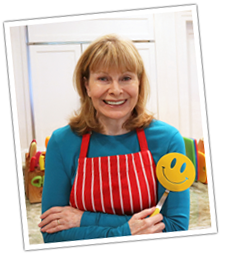 Jenny, thank you so much for all your recipes! This chicken parm recipe is so good! I will never fry chicken parm again! Don’t need all that grease in my food. The hot oven makes the chicken crisp up and gives a little crunch. Served it with a tossed salad with your homemade Caesar dressing. YUM! Thank you so much. One of your new fans. Thank you. Loved this recipe for chicken! I can’t explain what a find you were to the way of cooking. I have fallen into “all your recipes” and we are eating healthier because of you. Thank You! Love your recipes. I am also a Londoner. Haven’t been home for awhile and miss it a bit. Thanks for the great website. Huge hit. fantastic job, your demos are great and love your sense of humor. recipes are great. Jenny, I LOVE your recipes….this will be on the menu for Saturday. I have to tell you something. A few years ago my husband bought me a nice stand mixer that untll recently has been a ‘countertop decoration’. Not until your pizza crust recipe have I felt any desire to ‘get it out’ and use it. I’ve been making your pizza for a few weeks now (love this crust) and am truly thankful for having found your recipe. I feel like a new woman LOL I actually USE my Kitchenaid now.. 🙂 thanks for all your wonderful posts, recipes and videos. company next week and will make it again. Thanks you’re the best. Yummy! I’m very happy to be apart of your email. Oh YUM! Sure to be a huge hit at my house.